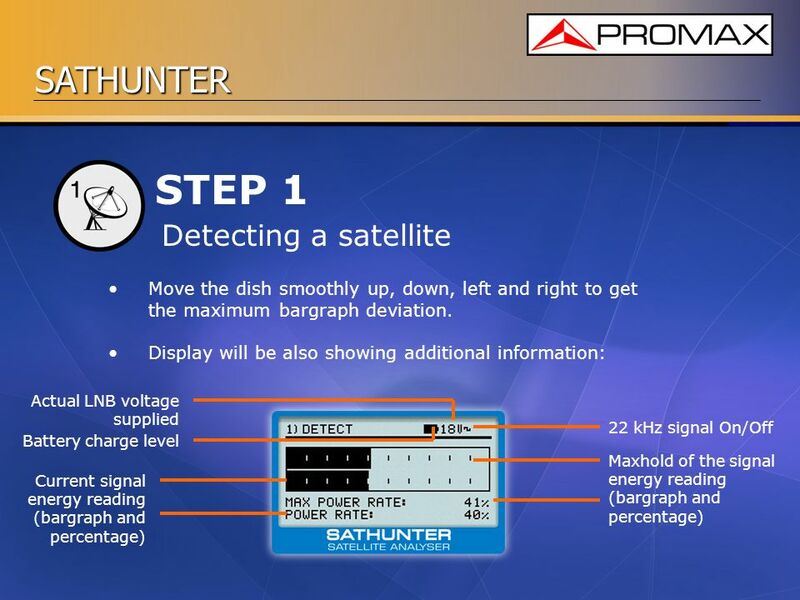 SATHUNTER Satellite pointing made easy DVB-S2 DVB-S.
will help you to start using your unit. If you have not got it yet, we hope it will help you to take a decision! fast and easy Anyone even with small technical knowledge can do the job. 4 Some hightlights Small, light, easy to use and rought. 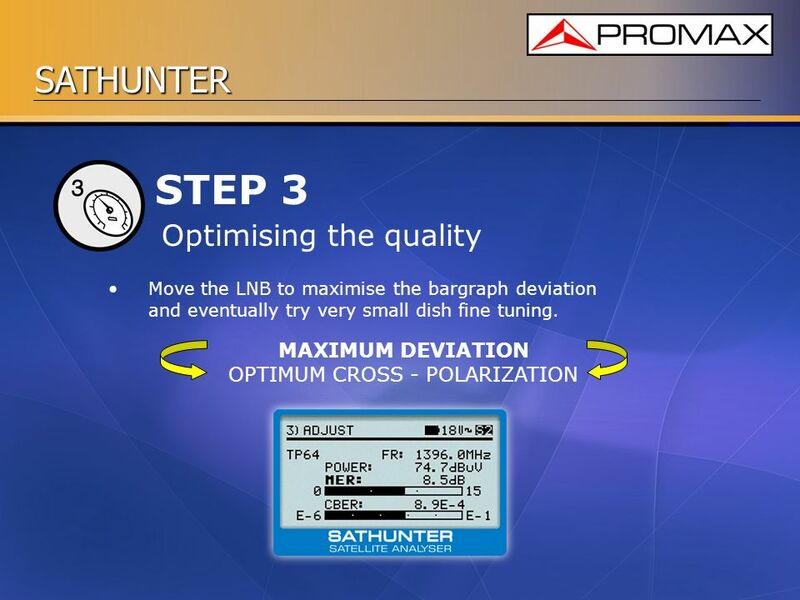 It works for DVB-S and DVB-S2. 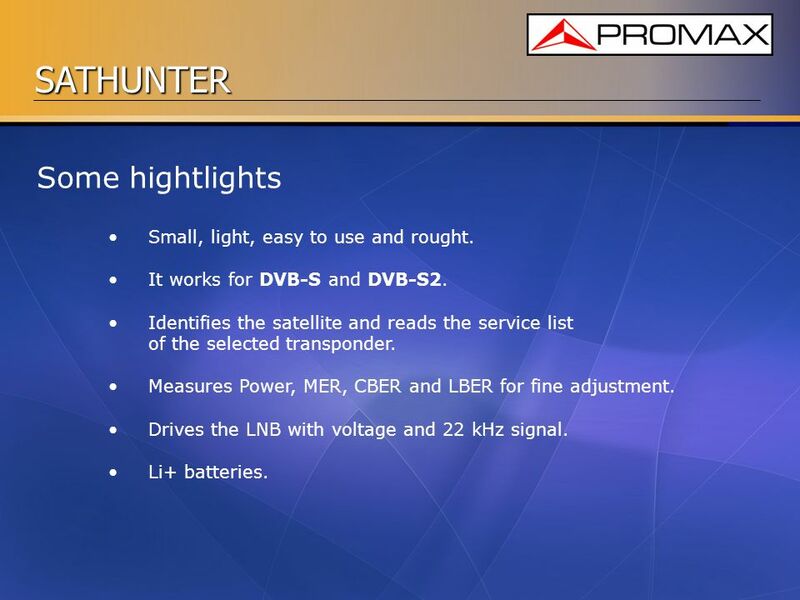 Identifies the satellite and reads the service list of the selected transponder. Measures Power, MER, CBER and LBER for fine adjustment. Drives the LNB with voltage and 22 kHz signal. Li+ batteries. 5 Before starting... 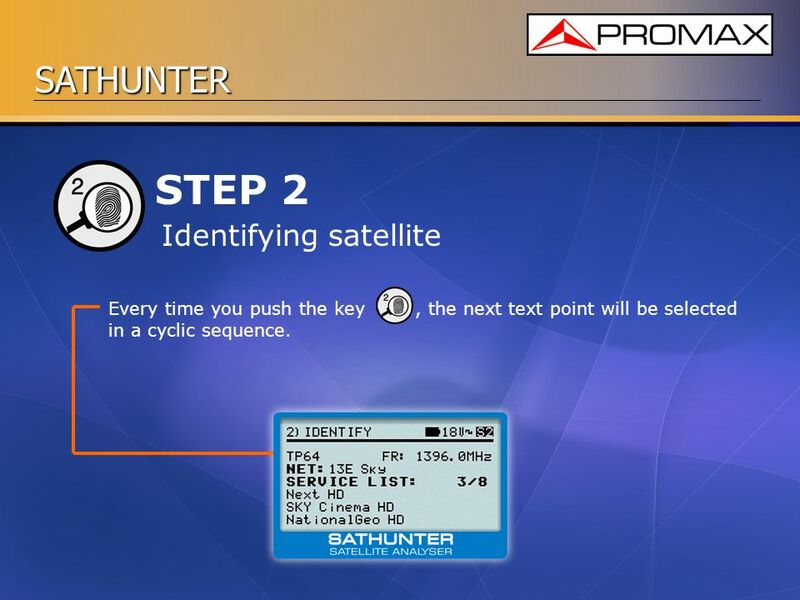 Check if the satellites / transponders preprogrammed in the SATHUNTER are good for your application. 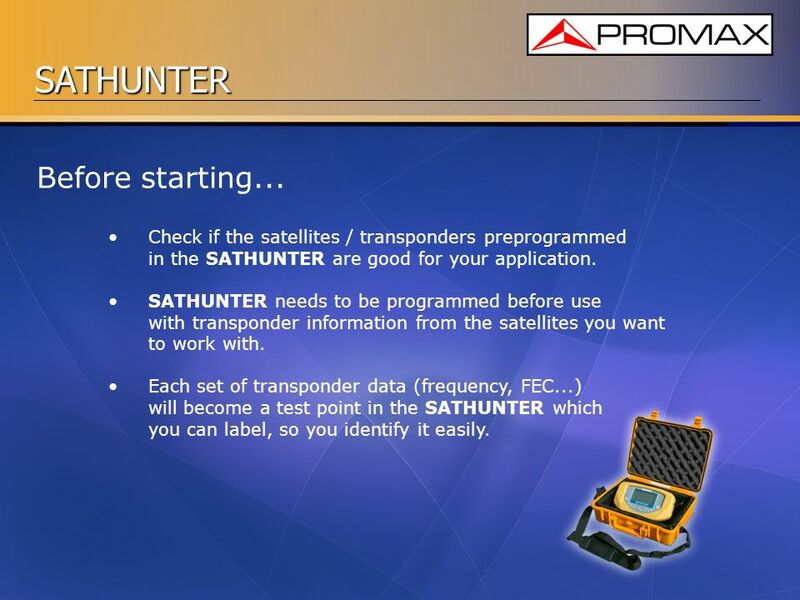 SATHUNTER needs to be programmed before use with transponder information from the satellites you want to work with. 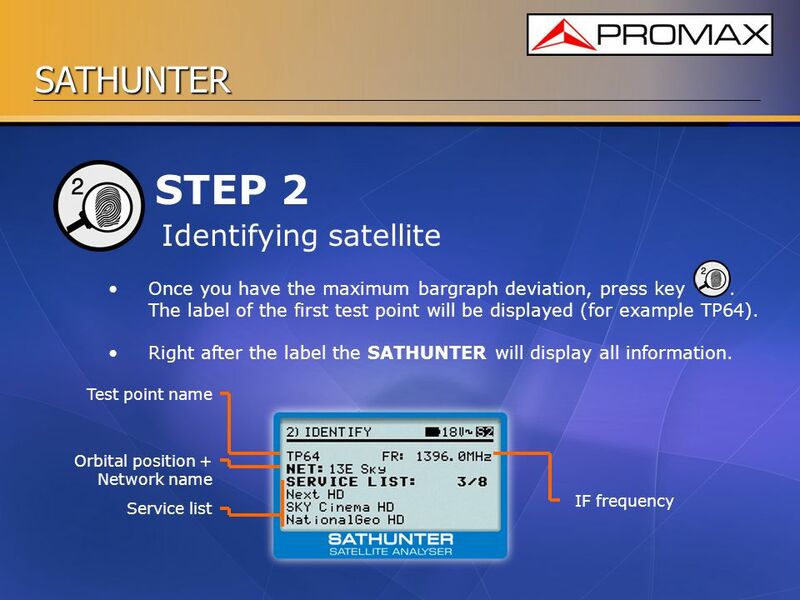 Each set of transponder data (frequency, FEC...) will become a test point in the SATHUNTER which you can label, so you identify it easily. 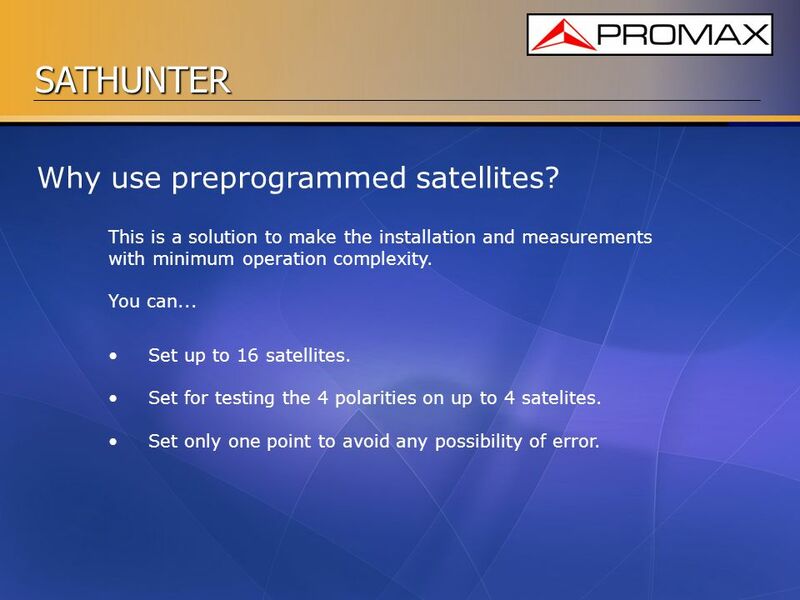 6 Why use preprogrammed satellites? This is a solution to make the installation and measurements with minimum operation complexity. You can... Set up to 16 satellites. Set for testing the 4 polarities on up to 4 satelites. Set only one point to avoid any possibility of error. 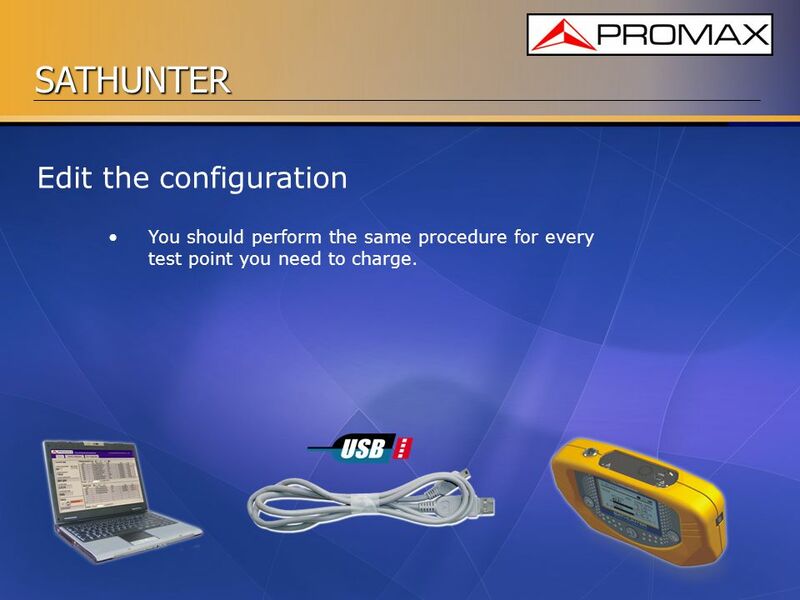 The input connector is a frequent point of breakdown in field instruments. 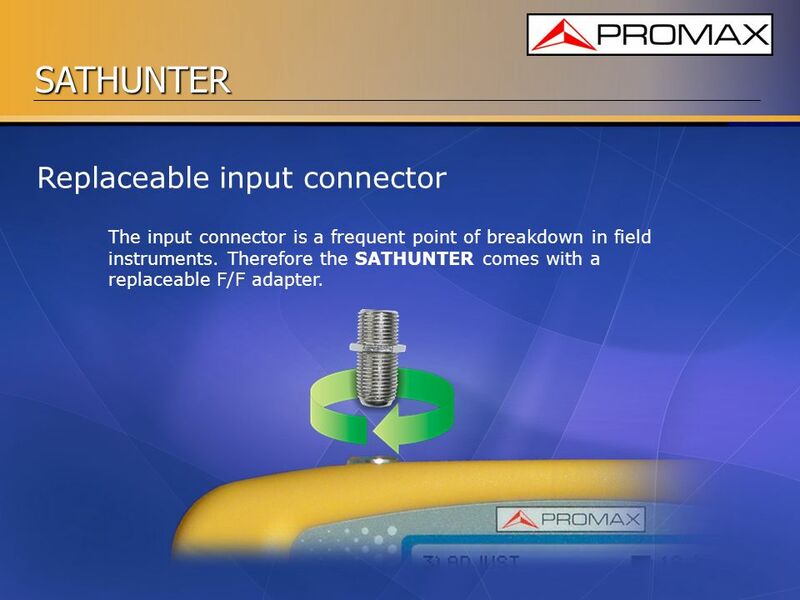 Therefore the SATHUNTER comes with a replaceable F/F adapter. 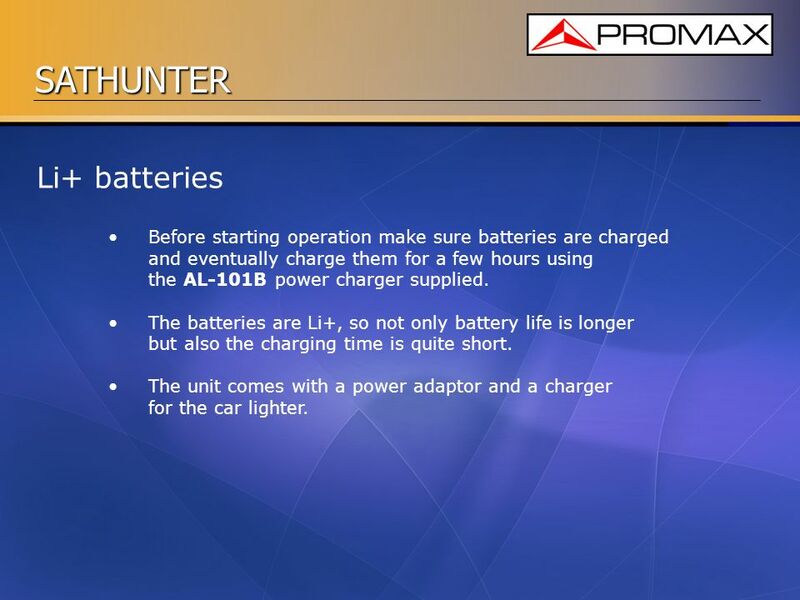 8 Li+ batteries Before starting operation make sure batteries are charged and eventually charge them for a few hours using the AL-101B power charger supplied. The batteries are Li+, so not only battery life is longer but also the charging time is quite short. The unit comes with a power adaptor and a charger for the car lighter. 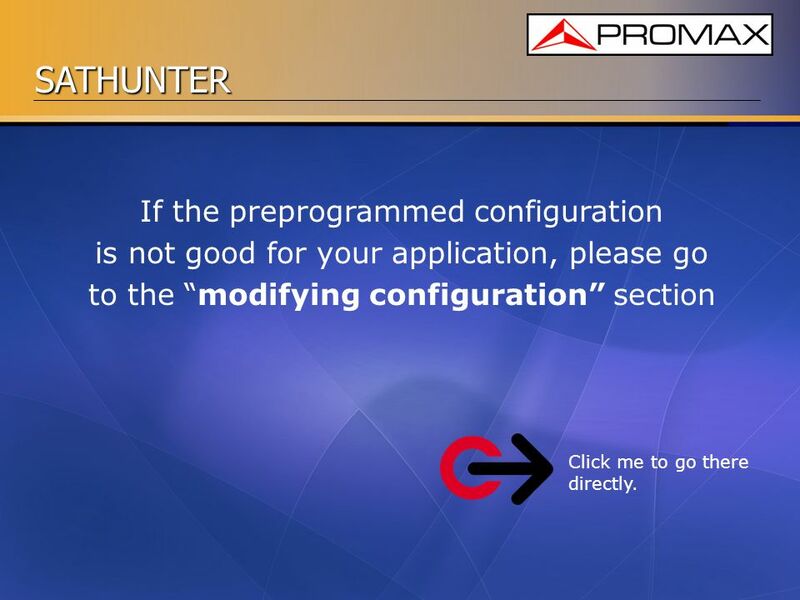 9 If the preprogrammed configuration is not good for your application, please go to the “modifying configuration” section Click me to go there directly. Switch on by pressing key # for more than a second. 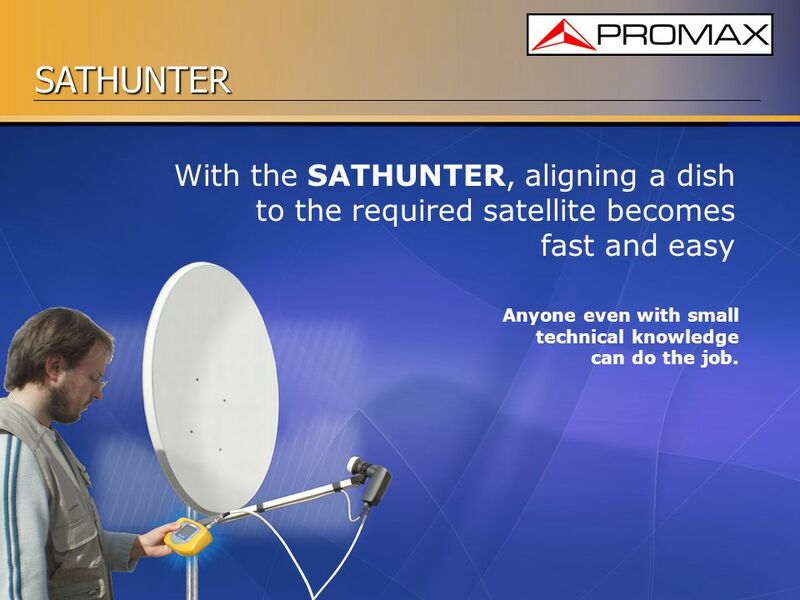 Move the dish towards the position where you’d expect to find the satellite you wish to align. 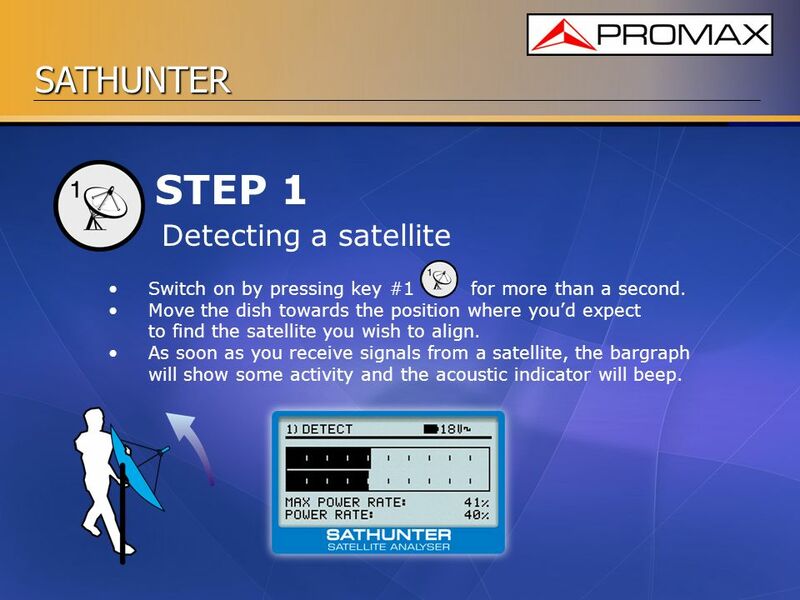 As soon as you receive signals from a satellite, the bargraph will show some activity and the acoustic indicator will beep. Every time you push the key , the next text point will be selected in a cyclic sequence. 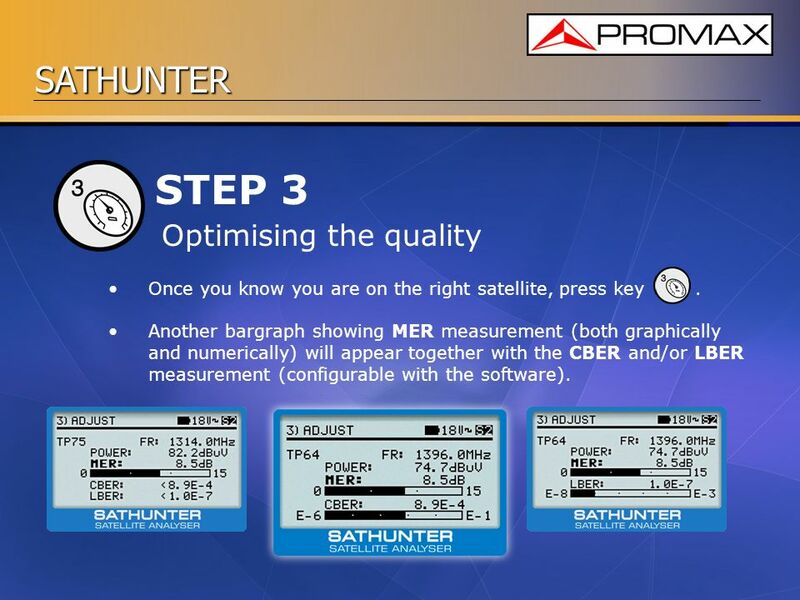 Once you know you are on the right satellite, press key Another bargraph showing MER measurement (both graphically and numerically) will appear together with the CBER and/or LBER measurement (configurable with the software). 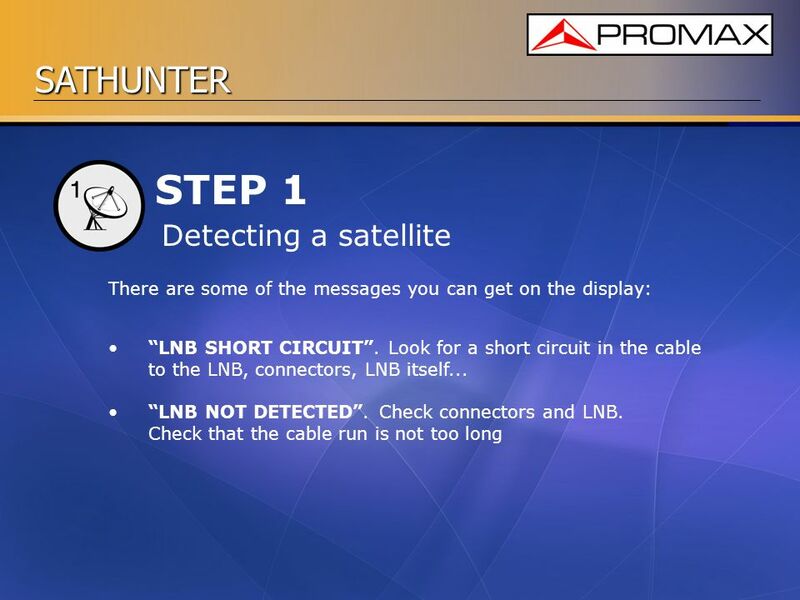 If you wish to work with satellites different to those preprogrammed from origin or wish to change the test points in any way, you should proceed as follows: Get information on the satellites and transponders of your choice. 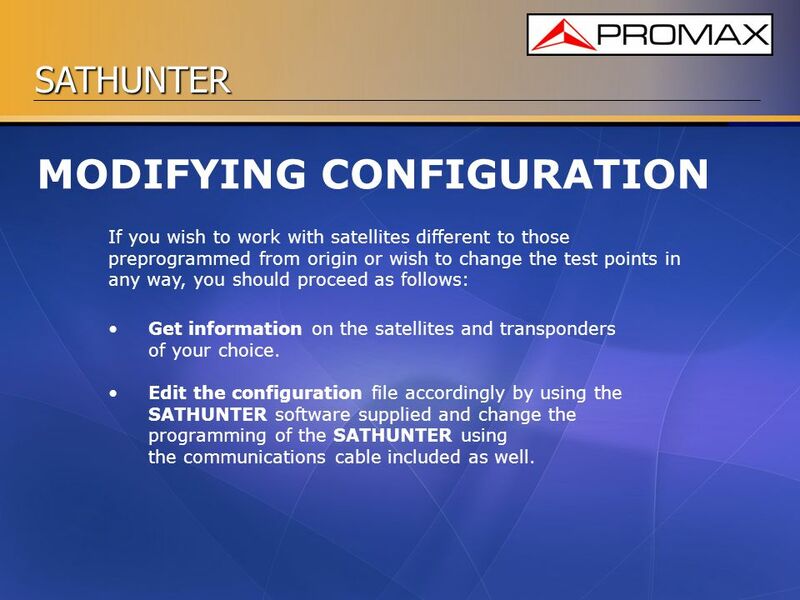 Edit the configuration file accordingly by using the SATHUNTER software supplied and change the programming of the SATHUNTER using the communications cable included as well. 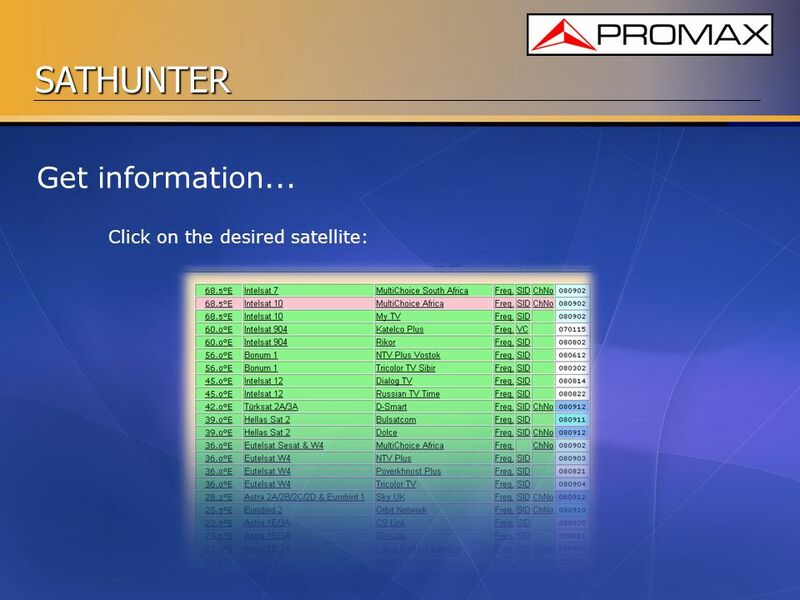 18 Get information... Satellite and transponder information is available through different sources. 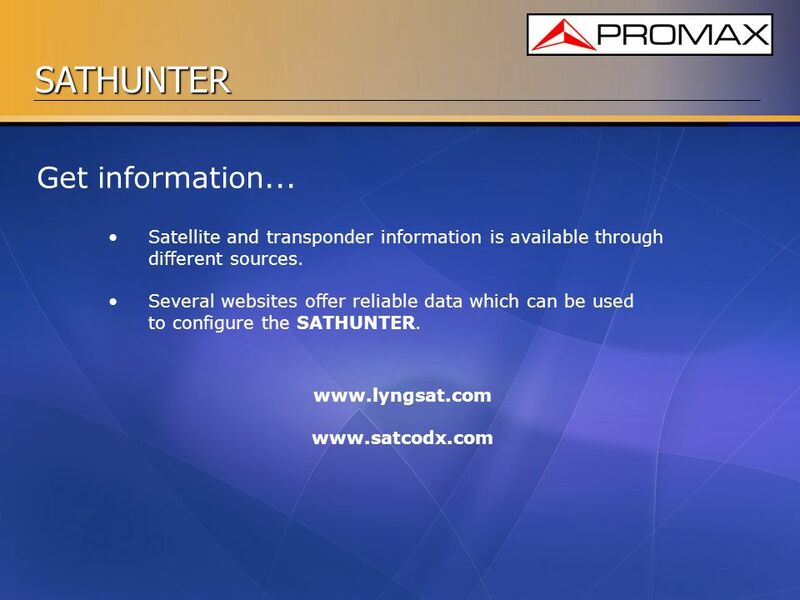 Several websites offer reliable data which can be used to configure the SATHUNTER. 19 Get information... 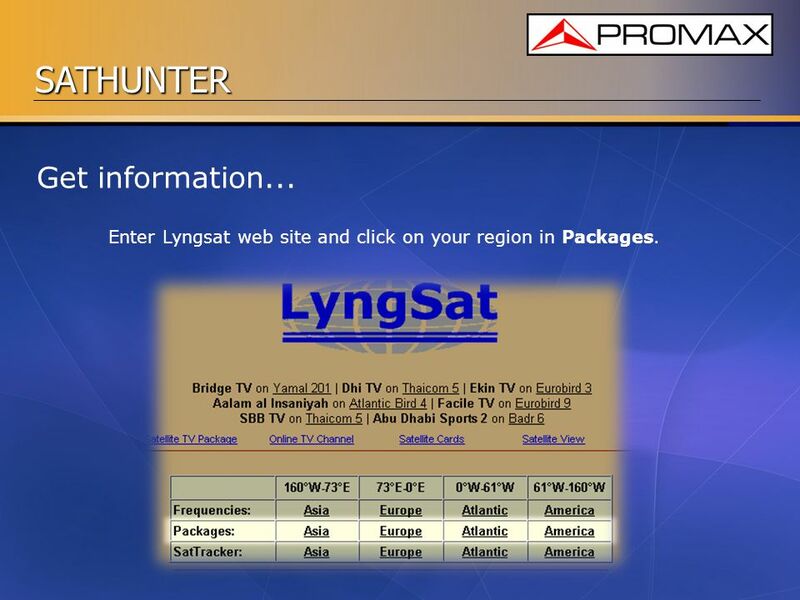 Enter Lyngsat web site and click on your region in Packages. 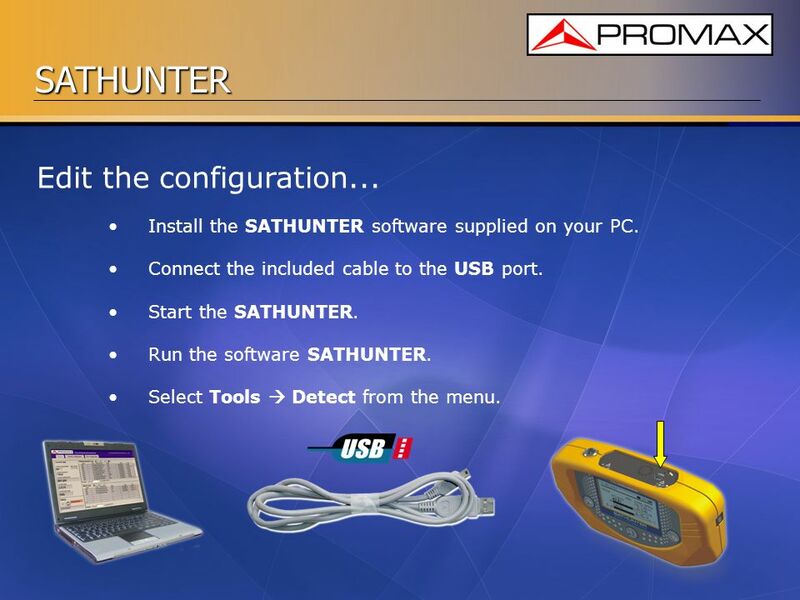 Install the SATHUNTER software supplied on your PC. Connect the included cable to the USB port. Start the SATHUNTER. 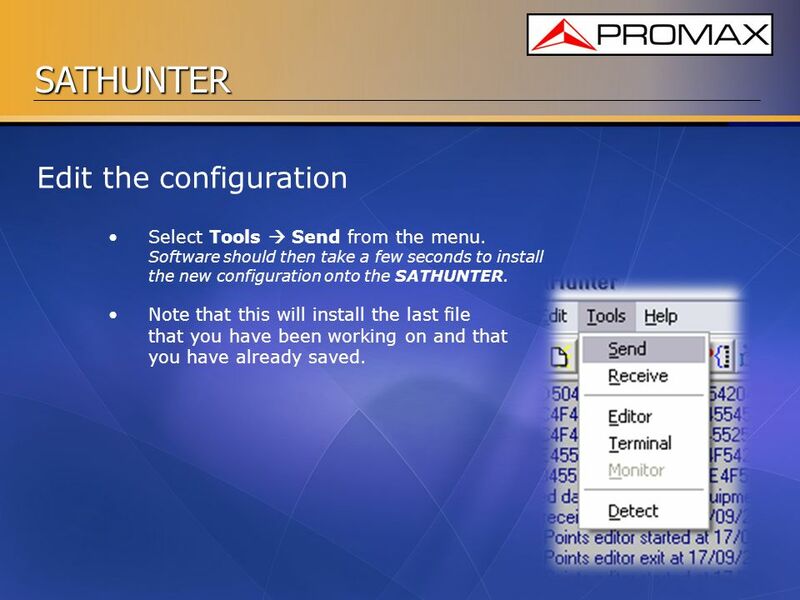 Run the software SATHUNTER. Select Tools  Detect from the menu. 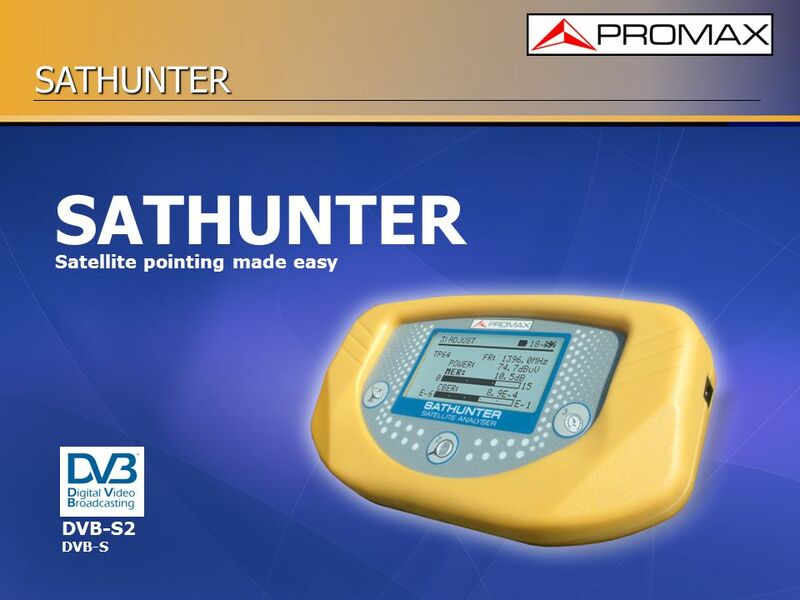 Select Tools  Receive from the menu Software should then take a few seconds to extract the test points which are currently installed on the SATHUNTER. Select Edit  Point from the menu. 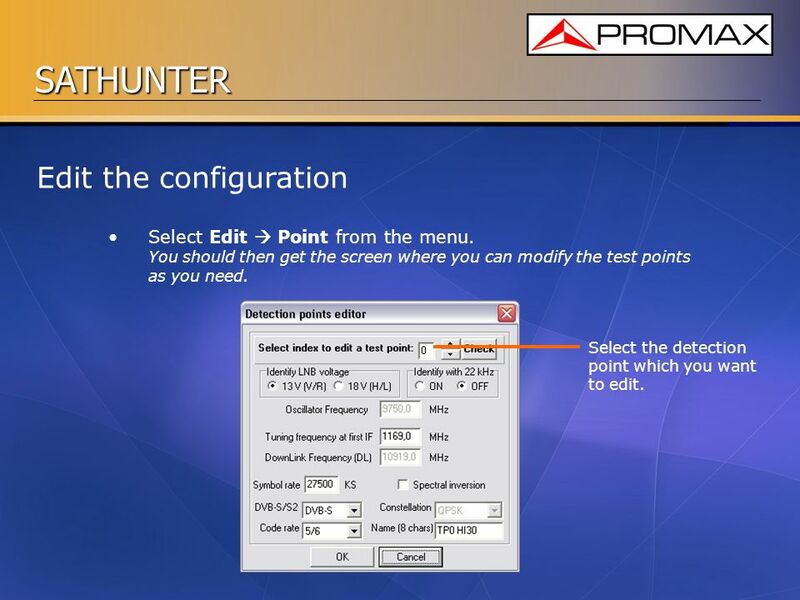 You should then get the screen where you can modify the test points as you need. Select the detection point which you want to edit. You should perform the same procedure for every test point you need to charge. Select Edit  Config from the menu. 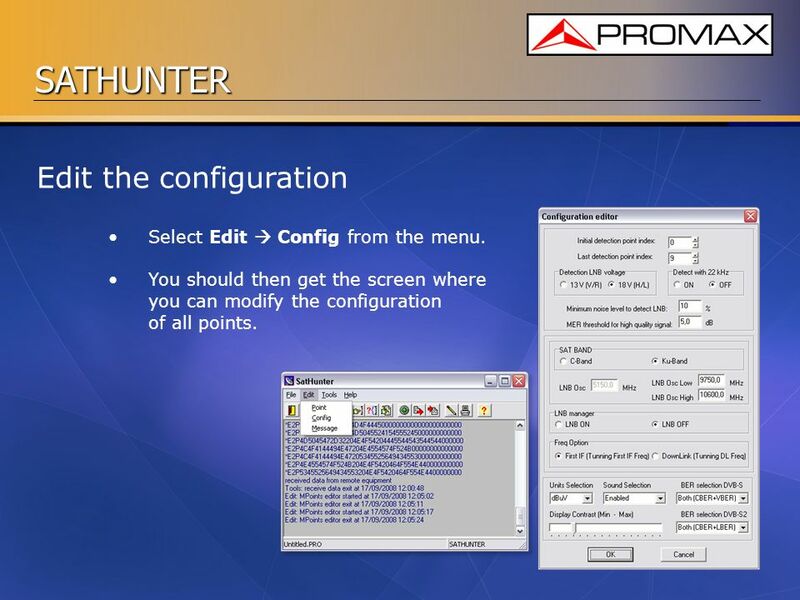 You should then get the screen where you can modify the configuration of all points. 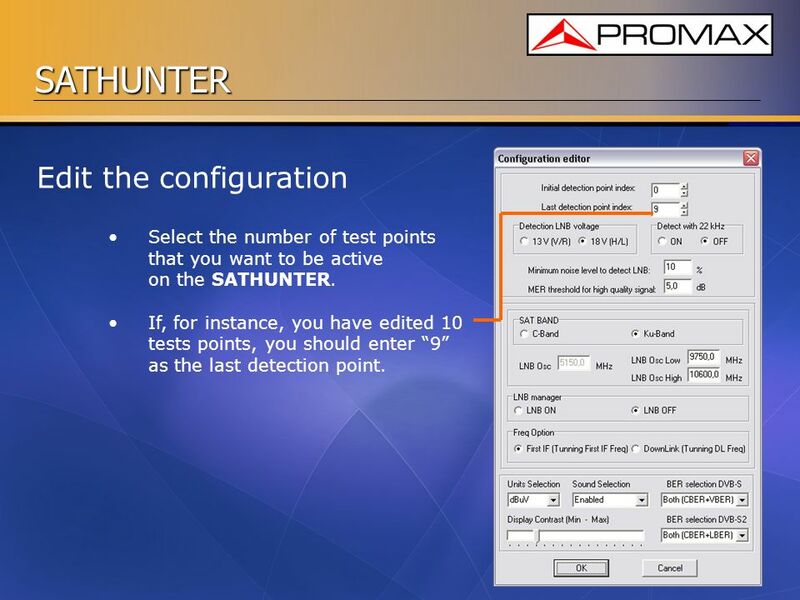 Select the number of test points that you want to be active on the SATHUNTER. If, for instance, you have edited 10 tests points, you should enter “9” as the last detection point. 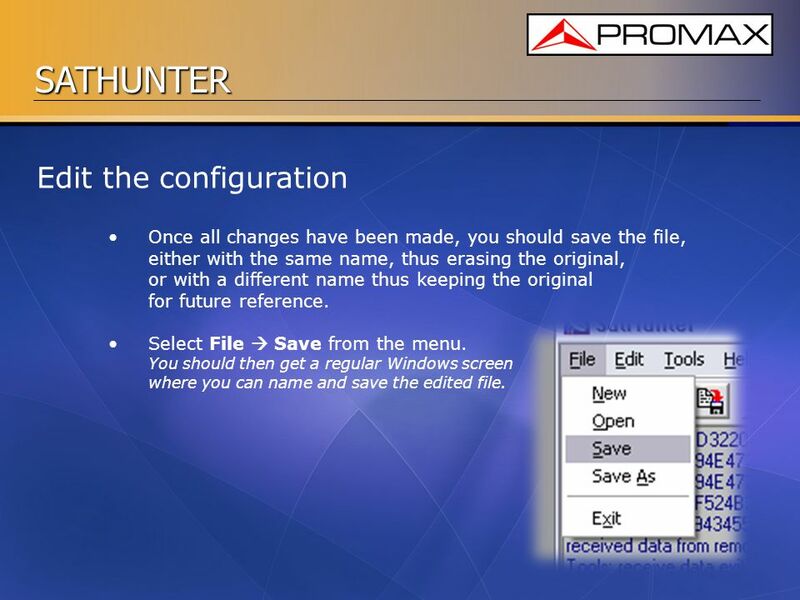 Once all changes have been made, you should save the file, either with the same name, thus erasing the original, or with a different name thus keeping the original for future reference. Select File  Save from the menu. You should then get a regular Windows screen where you can name and save the edited file. Select Tools  Send from the menu. 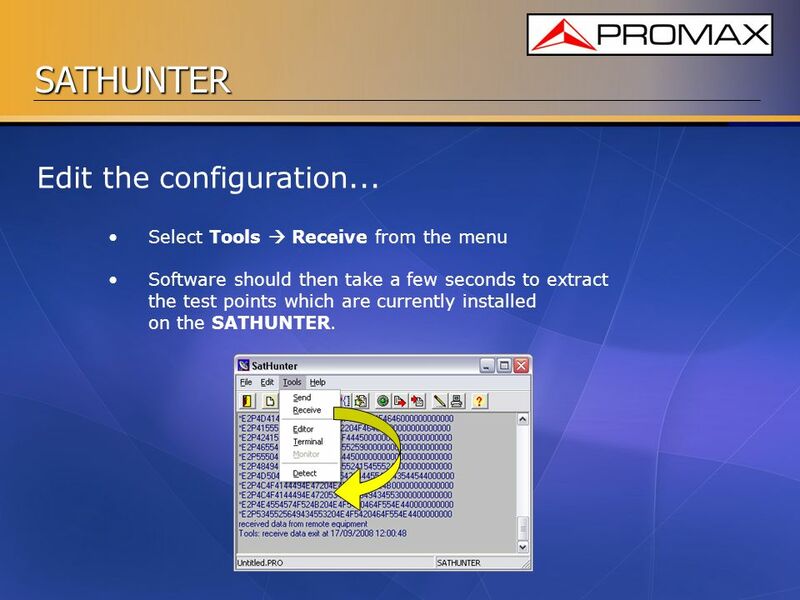 Software should then take a few seconds to install the new configuration onto the SATHUNTER. Note that this will install the last file that you have been working on and that you have already saved. Select File  Exit from the menu. 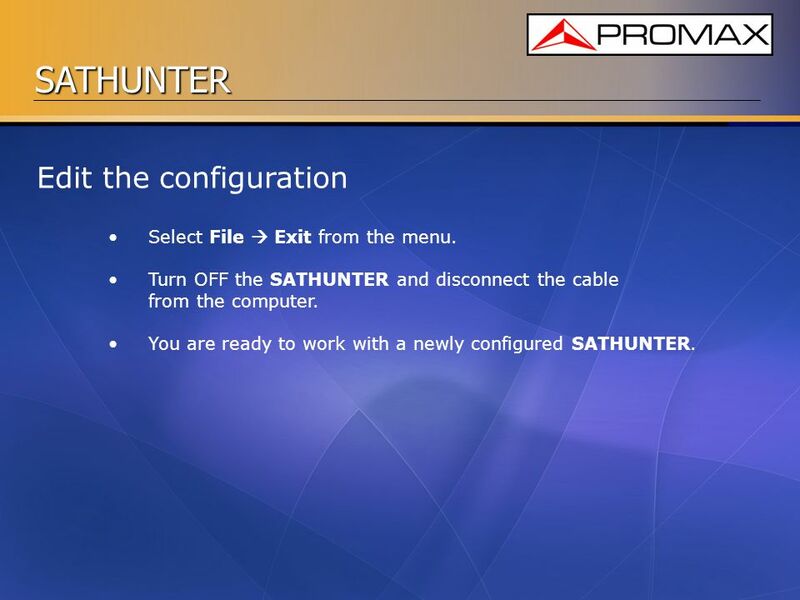 Turn OFF the SATHUNTER and disconnect the cable from the computer. 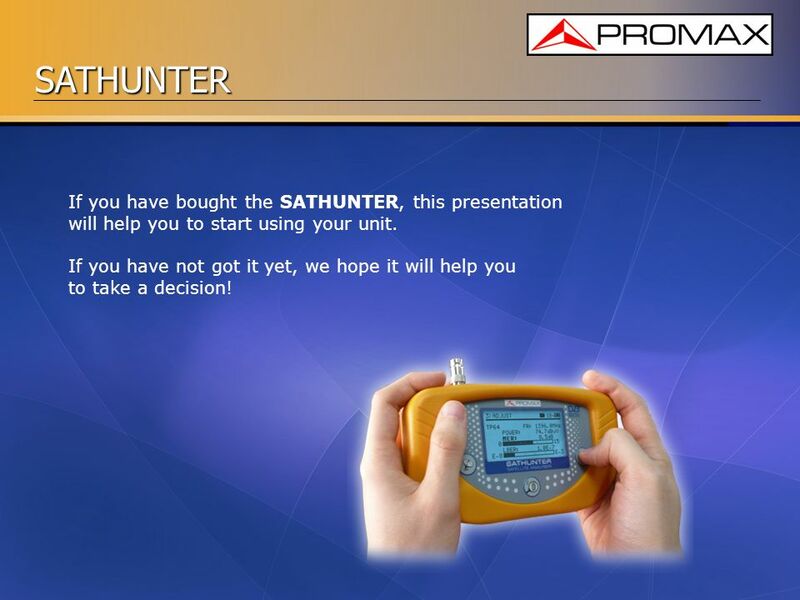 You are ready to work with a newly configured SATHUNTER. 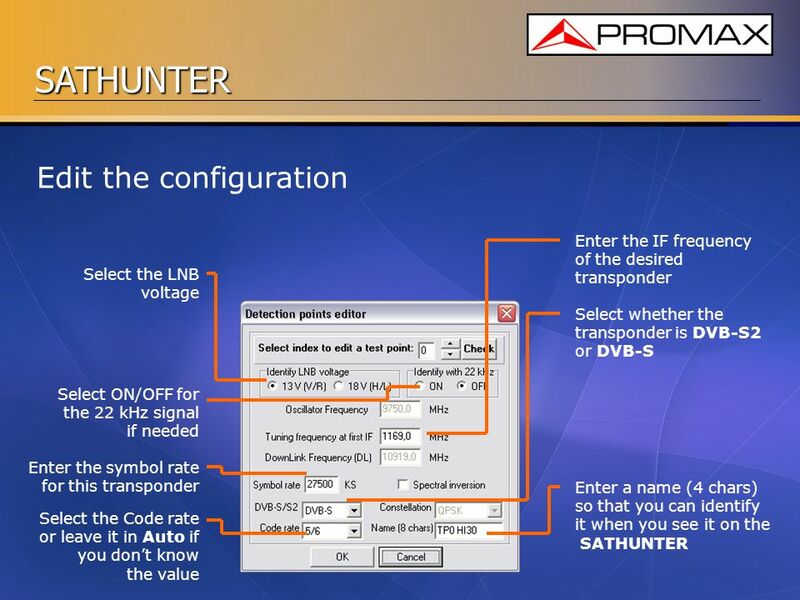 Download ppt "SATHUNTER Satellite pointing made easy DVB-S2 DVB-S."
How to use the NEC projector Its easy! Really!. How to use the NEC projector IMPORTANT-make sure you have reserved the equipment (projector and/or laptop). Touchsquid Technology Inc. Setting up the TouchSquid Remote App. PC Encryption installation progress/password screen Includes comments from: Encryption team Sarah Deane Tony Stieber Selected people who took part in the. Mobile Development Introduction to Visual Studio Development Rob Miles Department of Computer Science.